A group of excited schoolchildren ran across the wide deck of the Victorian ship in the glorious June sunshine while a group of somewhat more mature visitors took in the nautical surroundings. Surprisingly, the head of a life-sized model cow appeared from a stall on the deck, giving a plaintive moo. This was the scene on the wonderfully restored Steam Ship (SS) Great Britain in mid summer, the location for the latest SOFFAAM visit on 21 June. 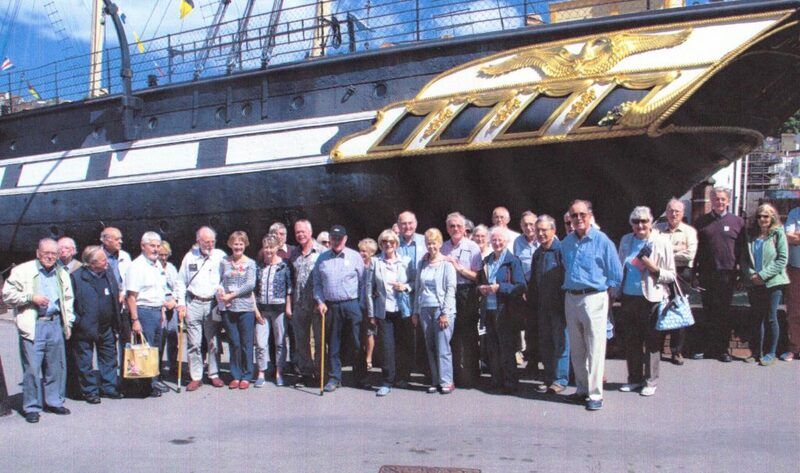 42 Society members had travelled up from Yeovilton and split into two groups to tour the vessel. Rescued from long decay in the Falkland Islands in 1970, Great Britain now rests in the very dry dock where she was originally built by the extraordinary polymath and gifted design engineer, I K Brunel. All the statistics concerning the ship are amazing, at 322 feet she was the longest passenger ship in the world from 1845 to 1854. Built of iron, displacing 3,400 tons, and equipped with a screw propeller, she was the first iron steamer to cross the Atlantic; which she did in 1845, in the time of 14 days. For all his genius, Brunel was not immune from financial problems. After a brief career as a trans-Atlantic liner, the ship ran aground in Northern Ireland and had to be re-floated at great expense. After refitting, Great Britain was directed to the Australia run in 1852, taking 60 days at a time to transport immigrants to the burgeoning colony, where gold had recently been discovered. In 1881, she was converted to sail and spent several years as a freighter before being retired to the Falkland Islands. Several generations of Royal Naval parties on ice Patrol duties visited the steadily deteriorating hulk in Sparrow Cove and the story might have ended there, but for the intervention of Sir Jack Hayward, who paid for the ship to be transported back the UK. The vessel arrived in Avonmouth in June 1970 and a lengthy refurbishment programme was put in hand. In 1998, extensive corrosion of the wrought iron hull was discovered. Remedial action consisted in the installation of a glass plate across the dry dock at the level of her water line and the installation of a complex de-humidification plant that keeps the atmosphere below the waterline dry and clean. The entire vessel has been completely refurbished and the surrounding buildings fitted out as museums. These celebrate, not just the vessel but the genius of Brunel and his father Marc. The Thames tunnel, the Clifton suspension bridge and the Great Western Railway are all demonstrated with modern audio-visual displays. We saw the completely authentic replica steam engines and admired the massive chain drive that gave a three to one increase in propeller revolutions over the crankshaft speed. We toured the accommodation, which included a rudimentary hospital and ranged from the comfortable first class saloon to the cramped and unhygienic quarters for the steerage passengers. We went below the waterline, to see the single screw and the revolutionary balanced rudder. We also saw at first hand the many rusted holes in the plating and marvelled at the de-humidification system that seems to be successful in keeping corrosion at bay. And the cow? Our genial guide explained that, in those days before on-board refrigeration, live cattle, sheep, hens and ducks were all embarked on the Australia run, to be despatched and butchered to feed the passengers en route. In this brief summary, it would be impossible to cover the entire experience in detail. The restoration and refurbishment work, which is still underway, coupled with the superb audio-visual effects, give an insight into Victorian life and travel on land and sea. Above all the entire experience is permeated with the spirit of that remarkable, irascible, chain-smoking genius, Isambard Kingdom Brunel. 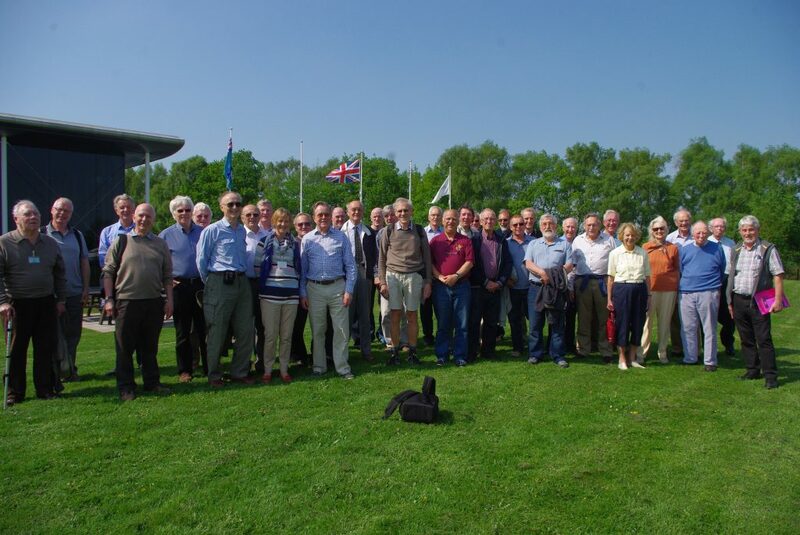 Thanks are due, as always, to Rosanne for her superb organisation; also to society member Philip Unwin for his witty and well-informed commentary. At 7.30 on a damp and misty morning, 39 SOFFAAM members and friends assembled at the FAAM to take their seats on the coach for the trip to the RAF Museum at Cosford, Wolverhampton. As we travelled north, the weather improved and by the time we arrived we found the impressive Museum buildings bathed in sunshine. Our party split up into groups, some to take part in a guided tour, others to explore the museum independently. It soon became apparent that this is an enormous museum, spread among two linked displays in Hangar 1 and a huge, futuristic structure housing the Cold War Exhibition. (A short video showing the construction of this building and the installation of bombers and fighters inside can be seen on the Cosford Museum website.) It would be difficult to avoid a mere catalogue of the huge variety of aircraft, weapons and equipment on display, but to choose just a few examples, RAF bombers on display include all three V-bombers, a Lincoln, Mosquito and Canberra, also one of only two remaining TSR2s. RAF fighters are well represented, ranging from a Hurricane and a realistic full scale model of a Spitfire, several Harrier variants, Meteor (represented by the “prone pilot”demonstrator) Hunter and Vampire. Enemy aircraft include a Fw 190, a Fieseler Storch F156, Me 163 Komet, and what must be a very rare surviving Me 410, also an Argentinian Pucara. The rocket-powered Saunders-Roe SR53 demonstrator, drawing its inspiration from the Komet, is also on display. Equipped also with a gas turbine engine, this could have been a precursor to manned interceptors with better climb performance than the Lightning, but its development was curtailed by the rapid development of surface-to-air missiles. Transport aircraft are very well represented, ranging from the VC10 on display outside the museum to the Avro York, Comet, Argosy and a Ford Tri-motor. It was particularly interesting to take a tour of the Short SC5 Belfast XR 371, named “Enceladus”, one of only two remaining aircraft of this type. We walked through its cavernous cargo interior and then visited the spacious cockpit, with seats for four crew. When retired from RAF service, several of these aircraft had been bought by a commercial company, Heavy Lift, although some had to be leased back by the MoD to support the logistic pipeline during the Falklands conflict. There was an eclectic display of bombs and missiles on display, including the first all-British atomic bomb “Blue Danube”, a re-engineered version of the 10 kiloton Hiroshima bomb. The bomb bays of RAF V- bombers were designed to take this and subsequent weapons, although the Vulcan was later adapted to carry the Blue Steel stand-off weapon. Also to be seen was the US-designed Skybolt, which would have given the V-Force a 2000 km stand-off capability but was cancelled before entering service. Other nuclear weapons on display included “Yellow Sun”, the first British fusion or “hydrogen” bomb to be deployed. Conventional missiles included a great variety of air-to-air and air-to-ground missiles, such as the Cold War Bloodhound and Thunderbird. Firestreak and AMRAAM missiles were to be seen, as well as Intercontinental and tactical nuclear warhead rockets, such as Thor and Polaris. Finally, in this area, it was fascinating to see the Polaris “Chevaline” system, with its two warheads and Penetration Aid Carrier, developed at vast cost and under conditions of highest secrecy by successive UK Governments and entering service in 1982. The background to the development of these nuclear systems was the so-called “Cold War”. Cosford’s National Cold War Exhibition makes a magnificent contribution to understanding the all-pervading climate of fear that enveloped the world after the establishment of the so-called “Iron Curtain”. Opened by HRH Princess Anne on 7 February 2007, the Exhibition houses 19 aircraft, tanks, vehicles, models and memorabilia. A Lightning fighter, suspended in the roof in a vertical climb attitude, makes a striking impact, while the sheer size of the V-bombers reminds us of the extent to which Britain contributed to the defence of the West. From the same era, we saw the Centurion tank, a successful British design that was exported widely and formed the precursor to the modern-day Chieftain. As our visit drew to a close, the SOFFAAM party assembled for a group photograph, before re-joining the coach for the trip back to Yeovilton. All agreed that it would have been difficult to have seen everything in this splendid Museum, but we all took away varied memories of a unique collection of aircraft and artefacts. Many thanks to Rosanne for organising the visit. To see the picture gallery of this visit, select the drop down menu in the title bar.